A little joey looks forward to leaving his mother’s pouch. With his first move into the outer world, he wobbles and falls. He’s ignorant of the dangers that threaten defenceless animals in the tropical rainforest. Two large dogs off the leash throw his mother over. The terrified joey hides in the shrub as mother races away in fear. 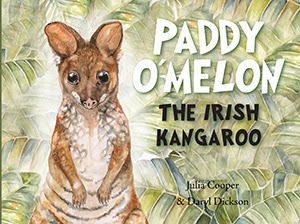 Little joey is named Paddy O’Melon by the Irish family O’Melon who find him. They live in the dip of the valley, and care for injured and orphaned animals. As Paddy grows, he is allowed outside where other rescued animals play. Erin the echidna, Kieron the king parrot, and Maggie the musky rat kangaroo become his mates. But who does Paddy belong to? Who are his family? Paddy sets out to find someone who knows who he is. This gorgeous story about the wildlife of the rainforests was the creation of highly regarded naturalist, Julia Cooper. Julia was born in the UK, but lived in Queensland, nurturing her passion for preserving the Australian bush and wildlife, and rehabilitating wounded and orphaned animals like Paddy and his friends. Unfortunately, Julia passed away in 2011 from an auto-immune disease, aged 33. This book is her legacy. Full page colour illustrations will make children aware of the animals that call the rainforest home; their protection, and the dangers they face from predators and humans. Daryl Dickson’s stunning images of these animals: a giant white-tailed rat, the Herbert River ringtail possum, Lumholtz’s tree kangaroo, the spectacled flying-fox, stripy cassowary chicks and the adult cassowary, lead Paddy to the end of his search. Children will discover what Paddy really is, and if he finally finds his mother.